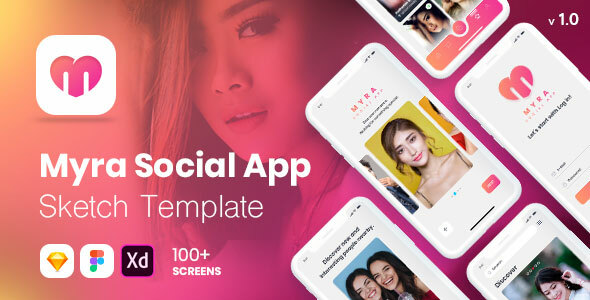 Myra social template is a delicate mobile screens pack for iPhone with trendy useful components that you can use for inspiration and speed up your design workflow. Compatible with Sketch, Adobe XD & Figma. It contains all 100+ screens (iPhone XR, iPhone X, iPhone 8 Plus, iPhone 7 Plus and iPhone 6s Plus) in layered and organized elements. Each screen fully customizable, easy to use and carefully assembled in Sketch. In order to edit the file, you need to have Sketch https://www.sketchapp.com/ installed on your system, and the fonts mentioned in the credits installed. On the left, the layers are well organized and grouped into folders, which make editing very easy. For support contact us at support@dsignsol.com and Please don’t forget to rate it.Thanks so much!